Who does not want peace? I know this is a rhetorical question and I am also aware that there are a handful of people out there who as a rule do no like peace. But for the rest of us, peace is the ideal state we are striving for but why is it so incredibly hard to attain? Part of this is because we live in a rapid world where we want everything and we want it now. I remember when Internet and computers were a new thing (yes, I am that old) and we had dial-up connections. That meant that websites loaded at a crawling speed; the top part of the image would appear and then the rest of the website came into full view after three to fifteen minutes of anxious and anticipated waiting. There it is, we would shout out with glee! Today we see people cringe and roll their eyes when the infamous loading sign appears. Patience is one of the virtues we have lost mostly thanks to modern technology. Everything is faster, more immediate and in your face. So when we speak of peace, we want it right now, not days, months or, God forbid, years down the road! Therein lies the problem because peace is something that needs to be fostered and must be given room to grow within ourselves. 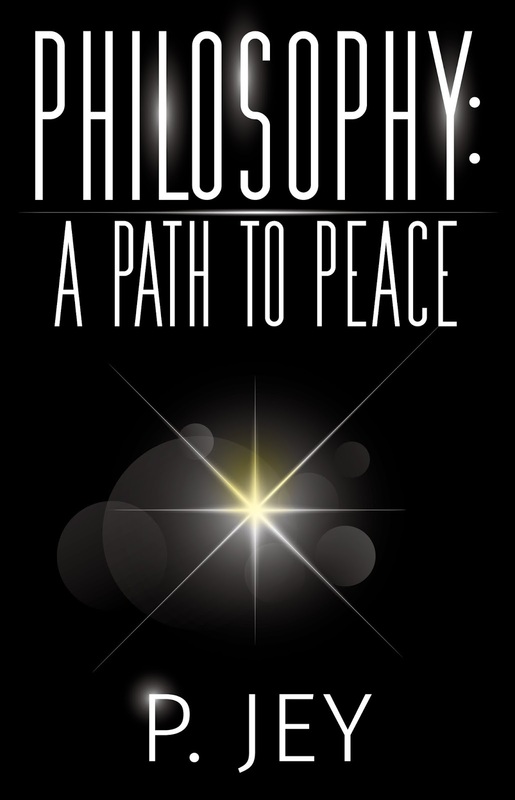 For a basic set-up of such a state and the steps you need to take, you can consult P. Jey’s book Philosophy: A Path to Peace, which shows you the ropes in a simple, clear and brief manner. Jey’s book draws heavily on Buddhist thought and practice and in this I completely agree with him. It may seem to be (and in fact is) based on common sense but more often than not we eschew the simple answers for more complicated ones. Yet the simple is often more difficult to do. The first half of the book consists of direct self-help advice and guidance with Buddhist precepts. One thing that Buddhism and many philosophers stress is to keep everything in moderation or as Jey puts it to have nothing in excess. He gives the example of a self-confident person; this person neither draws too much attention to themselves unlike an arrogant person or a braggart nor does she shy away or hide her own capabilities. Then, Jey extends his nothing in excess stance to everything in life and that is where he will meet resistance among many people. Why make more money than is needed for our sustenance? Why chase things we do not (really) need? Why overindulge ourselves in work and making money by neglecting or hurting other vital parts of our lives, such as our own well-being or quality time with family and friends? His ideas seem in conflict with the notion of ambition. We strive for success and that is something we are good at or at least we have been programmed to do most of our life. But in the whole process we devote significant amounts of time and energy to achieve this. It is our driving force but it is also both directly and indirectly a possible source of suffering. If we are content with what we have, not too much, not too little, then we would be much more content. That would help us also to cease or at least diminish our expectations (another source of suffering, especially when they are not met). We would suddenly get rid of stress and take it easy and focus on the more important things on our life, such as establishing and fostering relationships with ourselves and others. Ambition in itself is not bad, but when it becomes the overriding factor in our life or the sole measure of success, then it can be rather harmful. Success can be measured in other currencies than money and may take many different forms. Certainly, money can serve to increase our happiness and without it, we would have no peace and calm, but once we have a sufficient amount, we need to also focus on other aspects of our life and not neglect or dismiss them for the sake of a fatter bank account. As Jey aptly puts it, overthinking is another problem that interferes with peace and calm. In other words, we worry too much. I find myself guilty of this. When somebody is late for an appointment, many thoughts float through my mind. I come up with scenarios what could have happened, what it could mean, why all and any of this was happening, when, in reality, none of it is the case. We are rarely satisfied with nor do we go for the simple answer, such as a traffic jam but we tend to exaggerate the events: a heart-attack, a car accident, a personal slight or even complete rejection of our friendship. All this interferes with the enjoyment of the here and now and it also wastes my energy. Instead I could learn to silence my mind so I do not overthink but relax (of course easier said than done and involving a significant amount of mindful practice) and then I would not miss out on those precious moments of the present. Anyhow, my worrying will not make the person arrive on time. And yes, the present is the only time that exists. We all know that. But so much time is spent either thinking about the past or worrying about the future that we do not even perceive these fleeting moments move away from our grasp. Rarely do we realize the full potential and beauty of the present moment. The other significant piece of wisdom is that everything will happen in due time. Patience again is needed, and we should not force things. The universe, nature, fate or God follows its own course and has a purpose in mind. We need to be stoic and accept the results and know that in the end it is the best outcome. We may not see it at first or miss important blocks of the big picture, but there is a plan behind it all. Many might object to that because they either think they are in complete control (they are not) or they may reject or question the benevolence of the universe in a violent and seemingly random and irrational world. But nothing happens in isolation. I like the example of the domino effect that Jey provides to illustrate this point. Everything has been set in motion by other dominoes and our actions and existence will add more pieces that will have repercussions and topple future dominoes. Where we are at any moment of time has been caused by other moments and have further influences down the road. Hence, it is important that we fully embrace and clearly understand our present situation to be able to take mindful action that will resonate with our core being. In order to reach that state we should not be swayed by overthinking or by having unrealistic expectations. For example, if we want a job that pays extremely well and that is not possible, we may suffer and even blame ourselves for our lack of skills and abilities. This vicious cycle can be stopped by clearing one’s mind of too many desires and by appreciating and living in the present moment. Jey uses the metaphor of water often mentioned in Taoism, which stresses the importance of adapting to the environment and situation. Water can adapt itself easily to any type of container and can flow freely. It is open and flexible. Yet a mind set in stone will not be able to shift views or change opinions and will only block itself in the process eventually leading to frustration and exhaustion. But as Jey also points out water can also change its movement and be rough and violent when the occasion arises. Think of storms and floods and you will recognize the power that water can harness for its own purposes. In other words, adapting does not mean resigning oneself to the status quo; it means to seek appropriate action under the given circumstances. Sometimes while we are busy trying to push through one door, another one opens unexpectedly. We should be aware of this and change directions when we deem it necessary and beneficial. But if we have a one-track mind we are not only knocking at closed doors, we do not notice anything else going on around us. We miss the moment and many important opportunities that way and spend our time in a constant state of tension. Nonetheless, sometimes we do need to continuously knock or even break down that door. If it is something that is vital to our well-being and/or that of others, then we should not merely give in or accept consolations or compromises. All this, of course, depends on the circumstances, and they are best evaluated with open eyes and a clear and calm mind. They should not occur on the heated spur of the moment. Finally, I want to focus on the advice that would make a happy man sad and a sad man happy. It can be summed up in the following words: This too shall pass. This is a source of sadness for those who are happy and one of comfort for those who are suffering. What this means basically is not to get (too) attached to the present conditions as life has its natural rhythm of ups and downs. We should not try to desperately grab onto shreds of happiness nor lose hope when we feel down because all things will pass. So will our lives. This only emphasizes the importance of all those fleeting moments that make up a life. If we worry too much, chase what is not essential or even necessary for us at the expense of neglecting all that is important, we will lose out on important elements of our life. We need to know ourselves and let ourselves be and not be dictated by what others think or want from us. We cannot be at peace if we are not grounded firmly in our own identity yet we should remain open for change and growth and flow with time. I enjoyed P. Jey’s book. It may not have given me any new insights but it has only stressed the importance of those concepts so that I keep them in mind and practice them. We often lose sight of what is important and rarely consider the implications of the big picture; we often worry about unnecessary things or end up climbing unnecessary hills. This slim book with its sparse style shows us a possible path to find peace and how philosophy can guide us along the way, but in the end we ourselves have to take the first steps.